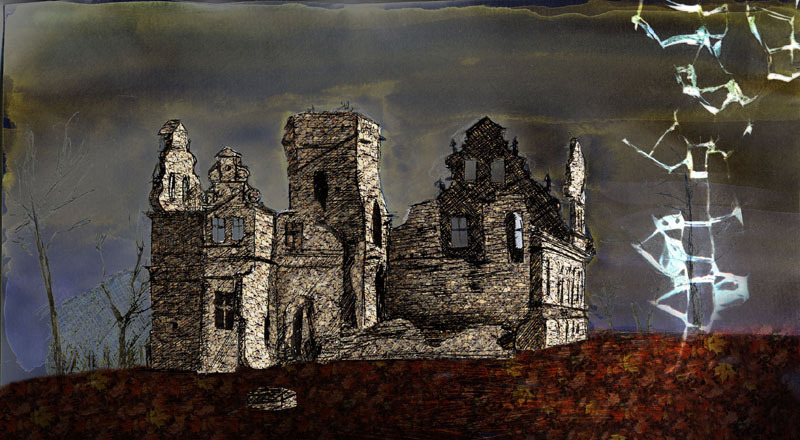 This is an unfinished piece I began drawing over a sketch I made of the Estonian 'ghost castle' hidden in the middle of abandoned, overgrown Soviet bunkers and a derelict airfield. This castle, much like this drawing, was never finished. It has had several owners and there are many stories surrounding it. One's a tragic romantic story. Completely untrue, of course. I preferred the story of the obsessed man who ran out or funds or life before he could finish it. We had to draw it from a distance because of the danger of falling bricks. The original piece is larger. It's partially an experiment in working with a greater resolution.